With the ongoing efforts of modern “green” building and the emphasis on energy efficiency, the typical consumer will undoubtedly run across the term Low-e glass when shopping for windows, doors or skylights. Whether the shopping is for new construction or a remodel project, it pays to know just what the terminology means. Tip: Roof Skylight Windows can also help you go more green. So, put on your thinking caps and we’ll journey back to school for a bit. You see, Low-e is a term related to thermodynamics, a sub-field of the science of Physics. Without too much technical jargon, we will look at the importance and the practical effects of Low-e glass for your home or office.As mentioned earlier, Low-e windows are important for energy efficiency. Here in the Pacific Northwest, efficiency is a money-saving benefit throughout our cool, wet winter months. Energy efficient home windows can keep our homes and offices cooler in summer and warmer in winter (think climate control), all the while saving our hard-earned dollars. By now, you may be wondering what the “e” in Low-e means. The technical term is emissivity. Emissivity is the ability of a material to radiate energy. For the homeowner, this is best understood as how much heat (radiant energy) is reflected back into a room in winter or reflected (kept) out in the summer. The bottom line, with low emissivity glass we get warmer rooms in winter and cooler in summer. Just like with insulating the walls in your home; insulated glass insulates your home’s windows. With efficient Low-e windows, your HVAC system will also be more efficient and thus less costly throughout the year. 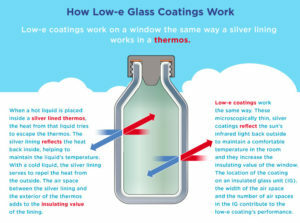 Additional benefits of Low-e glass include more than energy efficiency. With this insulated glass, your home will have less UV (ultra-violet) and infrared light damage. Think of the last time you saw faded curtains or furniture in your home due to sunlight coming in the windows. Another benefit is reduced condensation on windows at this time of year. Also, with the current push for more energy efficiency, many government municipalities offer substantial rebates or tax breaks for higher Energy Star ratings. Keep in mind, too, that Low-e insulated glass is made with both “hard” coating and “soft” coating applications. Basically, the hard coat is accomplished when the glass is in a molten state. It is especially used for storm doors and windows. The soft coat, on the other hand, is applied after the glass is made. While it is more efficient at reflecting heat, it is also more delicate. While the Energy Star program takes into account all the nuances of Low-e applications, it is best to ask your supplier for the specific details of any windows you may want to purchase. Keep in mind that in northern climates, subject to cold weather, the Low-e coating needs to be on the inside of the glass for greatest efficiency. In warmer, southern climates, the Low-e coating is most efficient on the outside of the glass. So, there you have it. For greater energy efficiency and year-round comfort in your home, use Low-e insulated glass for all your new window installation or replacement windows. If you decided to purchase windows with us, our window buying process is simple and pain-free. We also offer window repair, incase your not quite ready for new windows.